PennEast plans to cut costs on pipeline safety. The New Jersey Board of Public Utilities (BPU) determined that the federal pipeline safety statutes do not provide an adequate level of safety for the public. As a result, they have enacted far more stringent rules in the state, requiring that thicker Class 4 pipeline be used in all locations. PennEast is not subject to these BPU rules because it is an interstate pipeline, and has announced its plans to build thinner Class 2 location pipe rather than Class 4. How close are you to the PennEast pipeline blast zone? Interstate pipelines have especially high impact consequence areas as they are larger and are under high pressures. If you are within 1,500 feet of a ruptured and ignited pipeline, you have about 40 seconds before you suffer blister burns from radiant heat. Even worse, if you are within 750 feet you will have about 30 seconds before you are faced with a 50% chance of death. 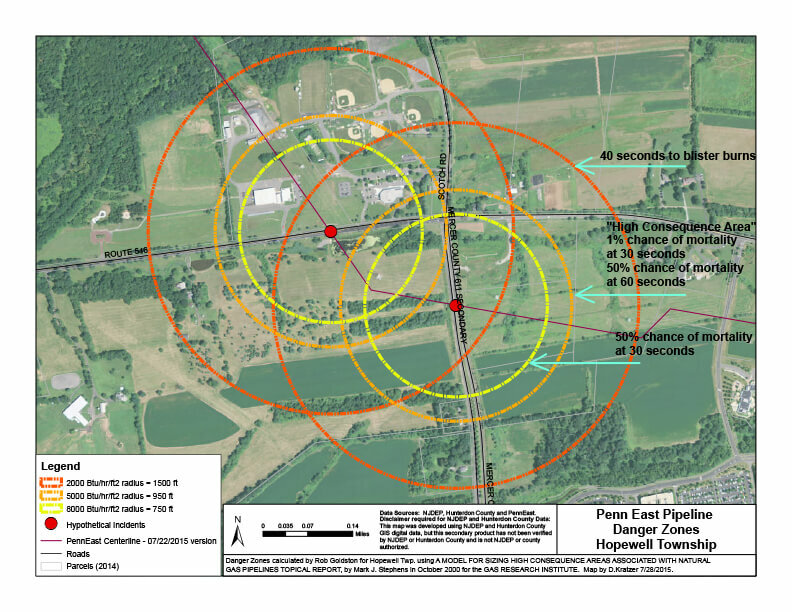 Map of proposed PennEast Pipeline’s impact zones near Hopewell Municipal Building and baseball fields. Danger Zones Calculated by Rod Goldston for Hopewell Twp. using a MODEL FOR SIZING HIGH CONSEQUENCE AREAS ASSOCIATED WITH NATURAL GAS PIPELINES TOPICAL REPORT, by Mark J. Stephens in October 2000 for the GAS RESEARCH INSTITUTE MAP BY D. KRATZER 7/28/2015.